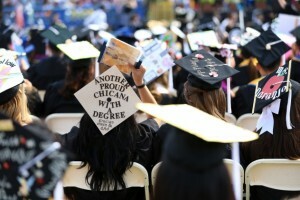 As 9,861 San Jose State students graduated during the 2016 Commencement at Spartan stadium, NPR aired a national story on its Weekend Edition morning show that highlighted SJSU’s plan to increase the number of undergraduate students who complete degrees in four and six years while also improving the educational experience for all students. 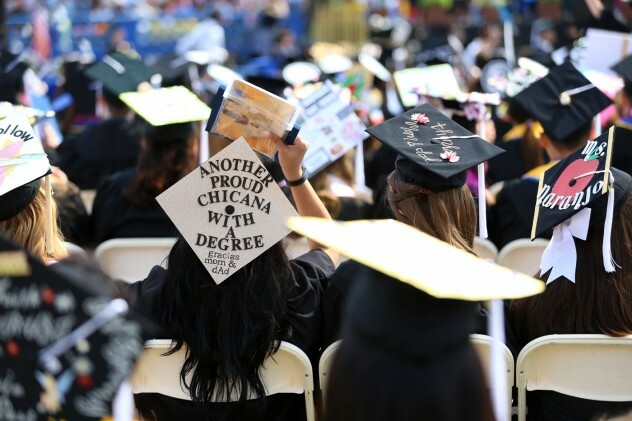 The story by reporter Gabrielle Emanuel includes interviews with Provost Andy Feinstein, Chair of Mexican American Studies and Co-Chair of the Chicano/Latino Student Success Task Force Marcos Pizarro and students. The story focuses on efforts to increase student engagement and connections to campus, including Pozole study nights hosted by the Chicano/Latino Student Success Task Force. Held around finals week, the events offers students comfort food, tips on studying and access to advisors. Provost Feinstein and Vice President for Student Affairs Reggie Blaylock released a student success plan in May that aims to address many of the challenges the students noted in the NPR story. Their data-driven, university wide plan aims to improve graduation and retention rates while also improving student experience. SJSU’s Four Pillars of Student Success: College Readiness, Advising, Student Engagement and Clearing Bottlenecks was informed by discussions and meetings with many campus stakeholders, including students. Some components of each pillar have already been implemented, including additional course sections in key bottleneck courses to be offered in the fall and an expanded summer bridge program for some students in need of remediation. Feinstein and Blaylock aim to fully implement initiatives from the plan in fall 2016. Read or listen to the NPR story online.